Some time ago Hans Kortenbach sent me an e-mail with including an attachment about the use of beeswax in audio related components. An interesting note as beeswax seems to have way of preserving things, due to some specific substances, as only beeswax can do... Also a sort of enquete was held among older radio repairsman about "the best encountered capacitor". Almost all of these men ansered: "Waxed capacitors". 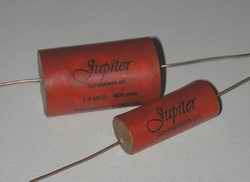 These capacitors were the most reliable ones throughout the years... Interesting stuff to read about! And what a surprise it was when I "surfed" the internet and encountered the Jupiter beeswax capacitor! This was at WelborneLabs, who had an introductory price on them as they were brand new... Quickly I ordered a few 0.22mF, with copper leads, for the price of $13 each (p&p excluded). Only a few days later (!) I had them at home and opened up the package. 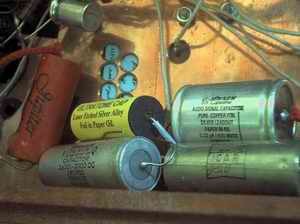 These are really beautiful made capacitors! You can feel the wax as they are not built in plastic or metal! They are also pretty heavy, most of the times a good sign. I'm using Jensen copperfoils (no plastic, C37 teated) at the moment, also having some Ultratones, Icars and VitaminQ's as reference. All have 0.22mF, so there should be no difference..
After a few weeks of listening, I'm still as enthousiastic about these caps as in the beginning! They have really gotten better, although the improvement gained in the beginning when swapping these, is not as big as then! Again a big hurray for "natural materials"?. ps. These caps have been listened to as coupling device on my preamp; a choke loaded Standard 4019A.